Also referred to as a combination of Bridge/Hellkite/Red, and Dragon/Drake/Wyvern. 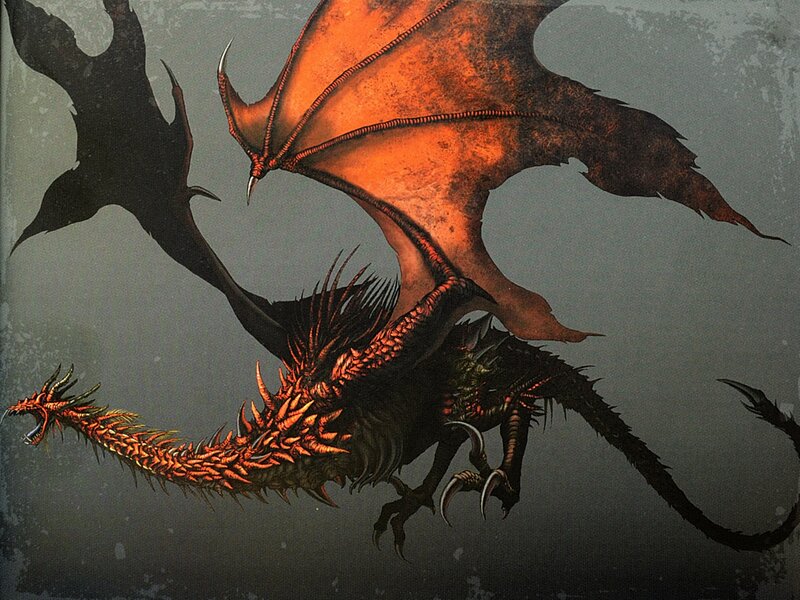 The Hellkite Wyvern is first encountered after the Taurus Demon in the Undead Burg area. After climbing up down one flight of stairs, look across the bridge to see several undead waiting for you. If you run across the bridge at full speed with shield up at a light weight (less than 25% of your equip burden), you can make it all the way to the midpoint of the bridge without getting hit by his fire breath and duck into an area on the right side that lets you activate the first shortcut in the game (a ladder down to your previous bonfire). If you walk across the side of the bridge (without running) you can sneak to the midpoint without getting burned by the dragon as well. This is confirmed to work on both NG and NG+ of the PtdE. First agitate the dragon into blasting the bridge with fire killing off all the hollows, easy enough with a bow. From the top of the stairs fire an arrow at the Wyvern and then switching back to your main weapon, run forward to where he should land. Once you're close enough hack away since if you're behind his claws his breath won't hit you. Once he leaps up into the air run back in the opposite direction to where he'll land and continue hitting away, repeat as necessary. I did this with a +2 Lightning Halberd and he only got to fly about once. Use a bow to aim spells at his head from under the bridge near the rat tunnel. If you can get past the Wyvern as explained above and join the Warrior of Sunlight then Lightning Spear can kill the Wyvern in 5-7 hits. This strat is good for faith users, and it may also be helpful for int-magic users. Same can be done with Soul Arrow/Heavy Soul Arrow. This is by far the easiest technique. Shoot the Wyvern from under the bridge; first cutting off the tail then shooting the head/neck. At base stats needed for the Short Bow (purchased for 1,000 souls from Undead Merchant (Male)) it will take roughly 350-400 arrows to take him down. (The Wyven will start to heal itself after a while. While it is healing it will hold its left wing over its head to protect itself.) After 1.05 patch. It looks like Wyvern cannot be killed any more with low level bows. No matter how many arrows you shoot, he keeps regenerating himself. If your bow deals about 120 damage per hit, there is a chance of beating him; it seems his regenerating ability is too strong -keeping him at about 60% heal. The Wyvern has a different animation for when it heals its damage, it will raise its wings as if its covering/licking its wings. It only does this while standing on top of the gate that leads to the bonfire. I was able to kill the Wyvern with a +5 Short Bow and a combination of poison and wooden arrows, if you only have wooden or standard arrows, save your arrows until you have access to poison arrows. Shoot the wyvern's tail from below the bridge to obtain the Drake Sword. equip the drake sword as your 2nd right hand weapon. 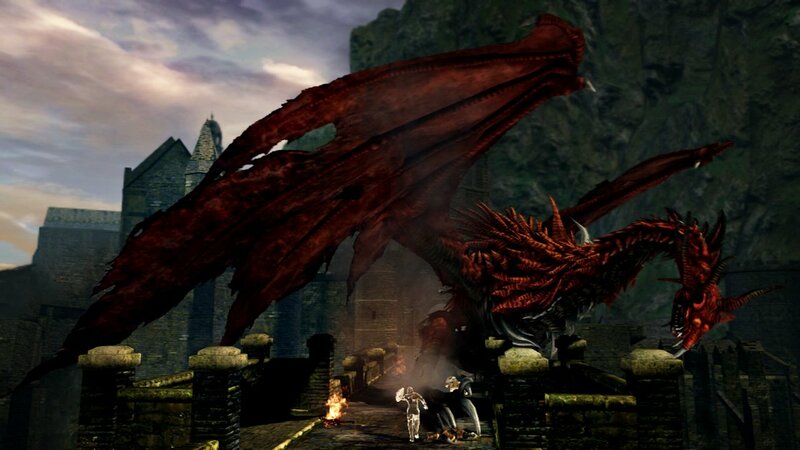 stand at the top of the stairs without causing him to breathe fire, shoot an arrow at his head/neck (this will cause him to jump down onto the bridge) quickly swap to the drake sword and hold with both hands while running into the center of the bridge and swing your sword. If you time it correctly, by time you swing your sword you will hit his head as he roars. now be quick and sprint back down the stairs. It will take a little practice but when you have it down you wont take any damage. it only takes about 10 of these to do the job. Note: it is possible to run past the wyvern if the player is able to roll between its legs when it lands on the bridge. This allows the player to use the bonfire across the bridge and open the gate to the Undead Parish. Be warned: the drake will fly away after you make it through, but it will keep returning to the bridge until destroyed. This means that the direct route across the bridge is still dangerous. If you have the Master Key, you can access the bridge, dragon free, by never walking up the stairs in Undead Burg where you first see the dragon. Instead, take the route Firelink Shrine -> New Londo Ruins -> Darkroot Basin -> Darkroot Garden -> Undead Parish -> Undead Burg. 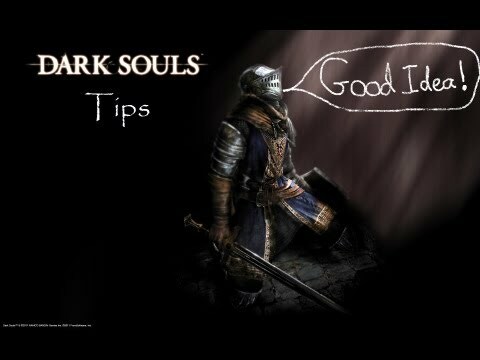 The route is dangerous this early on, and includes outrunning enemies much of the time, so you may want to remove armor during the New Londo and Darkroot sections. Note: Before glitch killing for 10,000 souls, ensure that you have farmed the 300 souls you receive for just walking up the mid bridge stairs until it is obsolete. I have recorded 10 souls per second which helped me quickly buy next level magic and levels to move onto the next zone. You may be surprised how quick 10k goes when you kill him vs farming for much more. After the 1.05 Patch: Shooting it from behind with one arrow can make it vanish into thin air, but it will come back during a later visit. No souls are rewarded for this. The Wyvern can also be attacked from behind the gate that leads to the Sunlight Altar. Approach from the rats or from the Undead Church, to prevent the dragon from flying away. Go to the top of the first stairs, where the undead soldier awaits, then turn around and walk along the ledge above the staircase. Do an overhead attack against the wall, right above the gate, and it should hit the wing of the wyvern. Alternatively, jump across to the small ledge on the other side of the staircase, where any attack should be able to hit it. Killing the Hellkite Wyvern, either normally or through a glitch, will reward you with 10,000 souls (50,000 on NG+). This is more than enough to catapult a character at low level up to be much more competitive with the monsters you are about to face. If you destroy the creature's tail by shooting at it with your bow, you can obtain the Drake Sword, a favorite starting weapon of many players, which has a base attack rating of 200. You can shoot his tail from below the bridge with a short bow to break it. It takes 28 shots with a Regular Short Bow using regular wooden arrows (done with minimum possible stats to use bow). Stand underneath the bridge, kill the couple enemies lurking around, and take your time shooting his tail. Each shot, he'll fly down to the bridge and stomp around before flying back to his perch. The Drake Sword will appear in your inventory when his tail is destroyed.